Whether you have questions about car repair or need a diagnosis for the strange sound coming from your vehicle, Curt’s Service’s complementary Pit-Stop auto inspection is the service! When it comes to auto inspection, Metro Detroit drivers know we perform an accurate and thorough check of all vehicles. Our complementary Pit-Stop inspection provides a comprehensive evaluation of vehicle safety to the condition of your windshield wipers. While newer cars are more reliable than ever before, it is important to have your car’s vitals checked between oil changes for top performance. Taking the steps for preventative maintenance can save you money in the long run, so why not take advantage of a complementary auto inspection? What Does A Pit-Stop Include? Every Pit-Stop is performed by a certified technician, who compiles a maintenance plan and comprehensive vehicle assessment. We then use this information to determine how much repair is needed on an older vehicle, whether or not to buy that used car, or as part of your yearly auto maintenance routine. If you need to know where your car stands in its maintenance cycle, one of our ASE Certified service consultants would be glad to run the manufacturer recommended maintenance schedule as well as our Service Intelligence smart car care report! At Curt’s Service, our goal is to keep your vehicle safe & reliable. We recommend you take advantage of our Pit-Stop service before and after road trips, every 3 months to monitor weather damage due to seasonal changes, and during your regularly scheduled oil change. 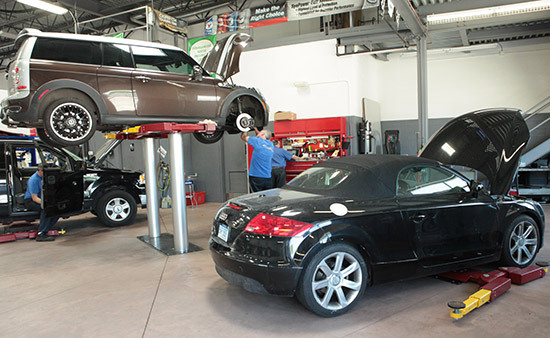 Being proactive about the condition of your vehicle will save time and money in the future. Getting it checked and repaired at Curt’s will increase your savings while insuring that the highest quality parts are installed by our ASE & Bosch Certified auto repair technicians. All of our services are backed by our 2 year/24,000 mile nationwide warranty. Stop wondering about your vehicle’s condition, and call Curt’s Service today or schedule an appointment online for a complementary Pit-Stop service!